One of the MaxiSys series devices, the MS908S Pro Diagnostic Platform bases on the revolutionary Android multitasking operating system, utilizes the powerful Cortex A7+A15 six-core processor, and equips with 9.7-inch LED capacitive touch screen. Supporting J2534 ECU Programming Device is capable of replacing the existing software/firmware in the Electronic Control Units (ECU), programming new ECUs and fixing software-controlled drivability issues and emission issues. MS908S Pro is an ideal tool for a truly trouble-free diagnosis of a maintenance plant by quickly, efficiently and effectively diagnosing automotive faults, managing customer data, and standardizing business processes. MaxiSys is the fastest scanner ever in the market. It features an extraordinarily fast A9 quad-core processor, a 32G solid state hard drive and a highly sensitive 9.7’’LED capacitive touch screen. The revolutionary open source Android Opearting System allows you perform multiple tasks easily and intuitively. 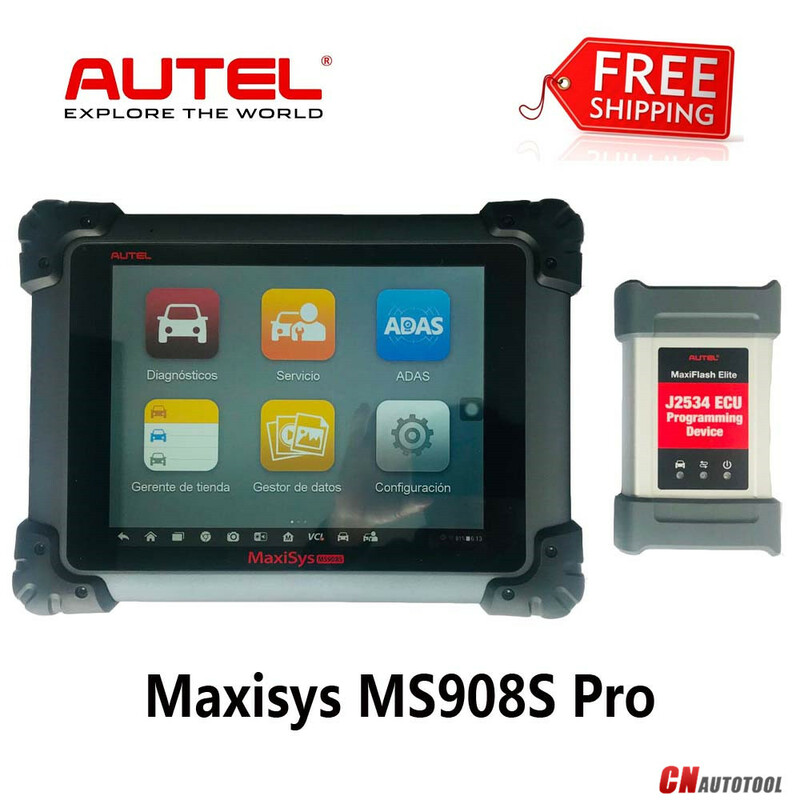 The Autel Maxisys Pro MS908P system boots up in only 20 seconds, which is 5 times faster than competion products, and the diagnostic time for some vehicles is greatly reduced, allowing you to perform your job much quicker. Featuring the latest AutoVIN technology to identify CAN vehicles in one touch, and combined with the exclusive AutoScan function, the Maxisys Pro is the most intelligent system in the industry. These functions allow the technicians to easily detect vehicles, scan all the diagnosable ECUs on every vehicle and run diagnostics on selected systems. Another advanced feature, the industry first colud-based online community, puts you in touch with the latest tips and expertise from technicians around the world. The MaxiSys features advanced dual-band(2.4GHz and 5GHz)802.11n Wi-Fi that’s up to twice as fast as any previous-generation diagnostic systems. The MaxiSys Vehicle Communication Interface(VCI) connects via dependable Long-Range Class 1 Buletooth to the host tablet. Once the wireless VCI is connected to the car, the technician is completely free to move around anywhere in the shop. Its wireless connectivity also means you can field updates to the latest software releases, allowing for update anywhere and anytime. As the fastest growing diagnostic company in the world,Autel has been committed to providing the best and easiest-to-use diagnostic solution with the most extensive coverage of all systems for all the major vehicle manufacturers. This enables independent garages to confidently provide comprehensive servicing in their own workshops without relying on dealer availability. Continual software enhancement will provide additional vehicle coverage. The Coding function is used to configure the vehicle control modules(ECUs) with extra parameters, allow you to update the computer software on the vehicle to the latest version. MaxiSys is one of the very few diagnostic systems in the world with the capability of preforming safe and reliable coding with affordable costs. To keep up with the continuing development of vehicle manufacturers, continuous software improvement is essential for any diagnostic system. Autel Maxisys was designed with this in mind. Whenever any unknown new vehicle model or a diagnostic error is reported, usually within 48 hours, custom software updates will be made available for the user to download. The remote technical support function enables Autel technical support personel to access the tool from a remote location. The method significantly reduces the call time, leading to faster problem resolution and increased customer satisfaction. Cat Connect technology and services are helping customers stay profitable no matter the challenge. Cat? Connect technology and services are the fastest way to boost productivity in fleets of any size. Proudly Powered by WordPress and Top Mag.